The Vanjara live in Maharashtra in India in Ahmadnagar, Bhir and other regions. Vanjara is connected to the word Vana which means forest. They speak Marathi and read and write in Devanagari. The Vanjara are not vegetarians but the women are not allowed to eat non-vegetarian food. They are endogamous, which means they prefer to marry within the group. A dowry is used in marriages. TProperty is inherited by the sons when the father dies. Women do housework and farm work. The dead are cremated except for children under eight who are buried. There is a death pollution period. A caste council settles disputes among the Vanjara. They are Hindus by religion. Their work is mainly in agriculture. 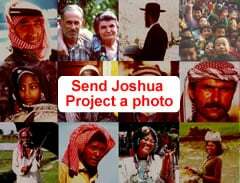 They have a low literacy level so the gospel needs to be given in oral form as well as written. Family planning is used by them. * Pray that leaders of the caste council will come to Jesus Christ and lead others of the Vanjara to salvation too. Singh, K. S., ed. 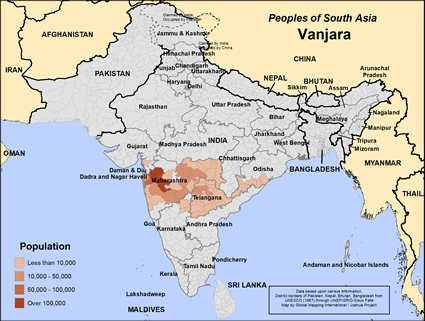 "India's Communities A-Z", Oxford University Press, USA 1999View Vanjara in all countries.